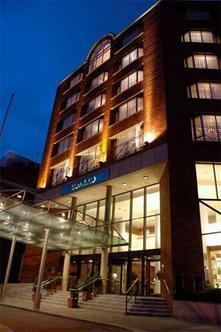 Five star deluxe hotel located in the heart of Dublin's city centre, just opposite the National Concert Hall and around the corner from beautiful St. Stephens Green. The Conradë Dublin is only minutes walking from fashionable shopping on Grafton Street. For those interested in cultural activities, Trinity College, The National Art Gallery, The National Museum and Georgian Dublin are in the immediate vicinity. For the sport enthusiast, the hotel is ideally located for your needs including great golf courses such as Portmarnock and Royal Dublin nearby. The Conrad Dublin is home to one of Dublin's finest restaurants-The Plurabelle Brasserie with its bright and airy atmosphere and food to match The hotel's traditional Irish Pub "Alfie Byrnes" is as popular with the locals as it is with hotel guests. A state of the art fitness centre is also available for hotel guests.